I’ve finally gotten to my summer. Yay! Since my duties as a teacher have been put on hold until August, I’m now free to write as much as I want. Yay! I’m hoping to get my 2nd bounty hunter book submitted to my editor by the end of this month. I also want to get a rough draft of book 3 done during July. Other than that, I’ll be hanging out with friends and family to enjoy the warm weather. See you next month! If you see the book anywhere, send me the picture (with you in it). If you read the book, please leave a review. If you want to keep track of the Owen family and my future releases, subscribe to my newsletter! Hello! Another month has gone by and I’m 1 month closer to the release of my 1st Love Inspired Suspense, Fugitive Pursuit. I’m also enjoying spring, with warm weather and too many allergies. As a teacher, I’m counting down the days until the end of the school year. Once school is out, I’ll be able to be a full-time writer for the summer vacation. I can’t wait for that so I can finish up bounty hunter book #2 & get started with #3. Catch you next month! Welcome to March! I can’t believe how fast the year is moving along. 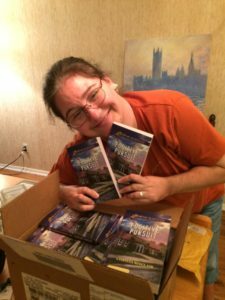 A few days ago I received my author copies of my 1st Love Inspired Suspense book, Fugitive Pursuit. I had just gotten back from a trip and was exhausted, but don’t I look happy? Before we know it Fugitive Pursuit will be available everywhere! It’s already up for pre-order on Amazon and Barnes & Noble. BUT you can also get a preview on the Love Inspired Suspense site. It’s several pages long so you’ll be able to get a good idea of what Zack and Jamie are like. Happy February! 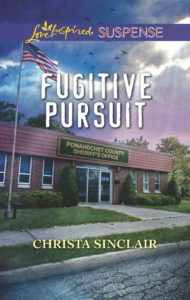 Only 3 months to go until Fugitive Pursuit hits the bookshelves! I’m getting more excited each day. I’m starting to plan giveaways and treats for newsletter subscribers leading up to the May 8th release. Do you want a sneak peek at the story? Check out the “Books” page and catch your first glimpse at Jamie & Zack! Happy New Year! I hope you’ve had a wonderful start to the new year. Did you make any resolutions or set any goals? I made the resolution to start getting healthier again. As for writing, I set 2 goals. I want to submit my 2nd Christian bounty hunter book to my editor AND I’d like to get the rough draft of the 3rd book done. I better get going! Santa stopped by early and left me a present! Coming to bookstores near you in May 2018! Hello there! As I get ready to take a break, I want to wish you Happy Holidays! I look forward to relaxing, reading and spending time with family this Christmas. I’m also excited to spend some quality time with the manuscript I hope will eventually become my 2nd Love Inspired book. Whatever you celebrate this month, stay safe! Hello! I hope November has started out well for you. Since I last posted, I completed the final edits for Fugitive Pursuit and I’m knee-deep in writing the next bounty hunter book. I’m hoping to submit it in the spring. I have 1 more week at work and then I’ll have the week of American Thanksgiving off. You can bet I’ll be celebrating with too much food, a lot of football and a bunch of writing! I’ll also be thinking of all that I’m thankful for- my family, my friends, my editor, and my future readers. If you celebrate Thanksgiving, enjoy your holiday. To everyone, have a look around the website, learn more about me and sign up for my newsletter. AND don’t forget to stop by next month! Hello! I’m so excited to have you here. In August, I signed my 1st Love Inspired Suspense book contract! Fugitive Pursuit, a story with the youngest brother in a family of bounty hunters, will be released in May 2018. 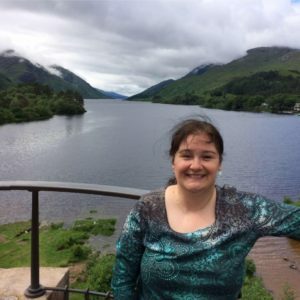 You can read all about the phone call that changed my writing life by visiting the Harlequin So You Think You Can Write blog. Don’t forget to check out the rest of my website and learn more about me. 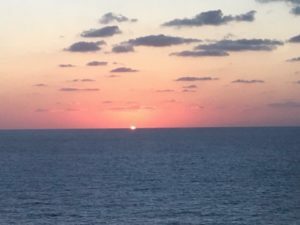 Plus, if you check here each month, I’ll be sharing some exciting event in my journey as a newly published inspirational suspense author!